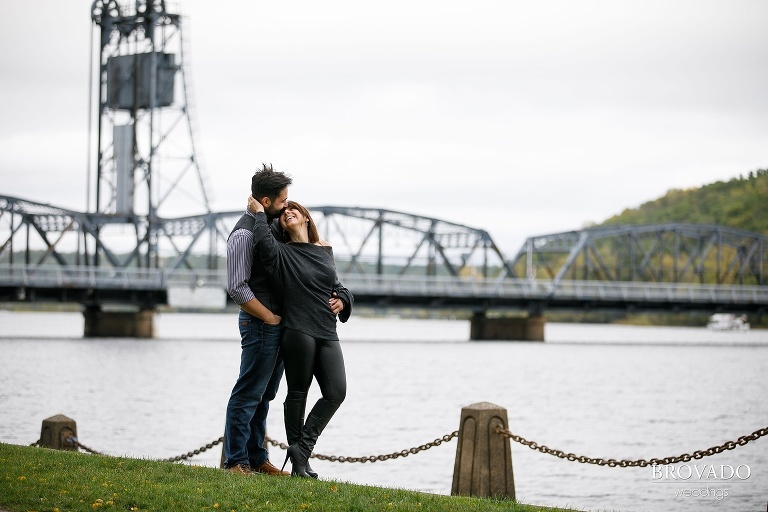 Yevgenia and Eugene love to travel, and made the short trip to downtown Stillwater for their engagement photos. Stillwater is always a gorgeous location, and it was even more so with the leaves starting to turn to autumnal hues and just enough crispness to call for a sweater. One of Eugene’s favorite things about his bride-to-be is that she shares his adventurous nature, so of course these two were willing to brave the winds of the river and to wade into the St. Croix for some stunning golden hours photos! These two have been together just short of 15 years, and became engaged while on vacation in Hawaii! They’re planning to have a second proposal once they have rings, because would it really be an epic love story without two proposals? In all seriousness, these two are meant to be together. The way that they speak about each other and the qualities that they share are proof that they’re the type of couple that will keep falling in love all over again. Yevgenia and Eugene, we are so honored to capture your bond, and can’t wait for more!